Spotify has just released its quarterly financial reports and the numbers are looking good for the Swedish company. The total monthly active users in Q4 2018 were 207 million, of them 96 million paying for the premium service. Compared with the same period in 2017, the increase is 36% from 71 million, while this holiday season brought 11% more subscribers than the previous quarter. According to Daniel Ek, co-founder of Spotify, the biggest reason for the increase is a holiday bundle in which Spotify Family accounts received Google Home Mini for free. 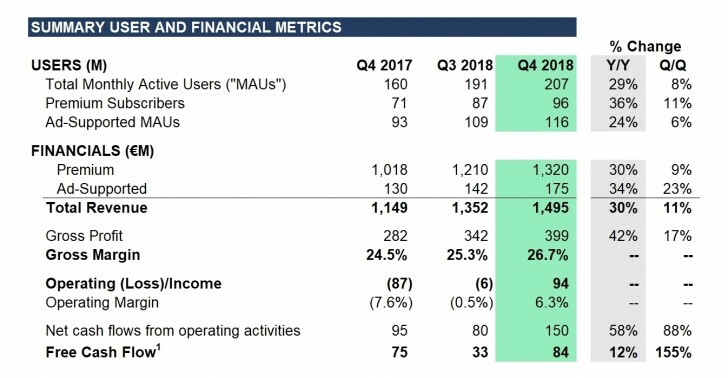 The total revenue of the company is nearly €1.5 billion, 89% of that coming from premium members, the rest from ad-supported monthly active users (MAUs). This is 30% more than Q4 2017, while profit grew 42% from €282 million to €399 million. 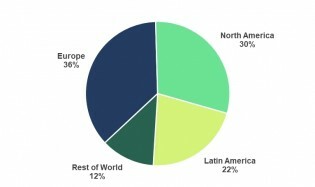 Spotify has also released raw numbers of its users across the globe. 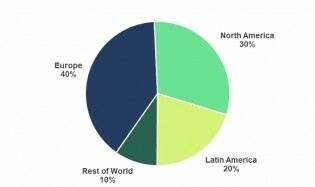 Total MAUs are mostly from Europe – 36%, followed by North America with 30% and Latin America with 22%; the rest of the world gets 12% combined. Subscribers, however, are less in Latin America and predominantly in Europe, with 4 out of 10 premium members living on the Old Continent. In the official press release, the company announced plans to expand its podcast portfolio. It acquired the Gimlet network, but even if the rumors were about a $200 million deal, Ek and company declined to clarify details. Spotify has also managed to buy Anchor, another podcast platform. He also shared that “over time, more than 20% of all Spotify listening will be non-music content”. He also said that Spotify has become the second-biggest podcasting platform, overtaken only by Apple.